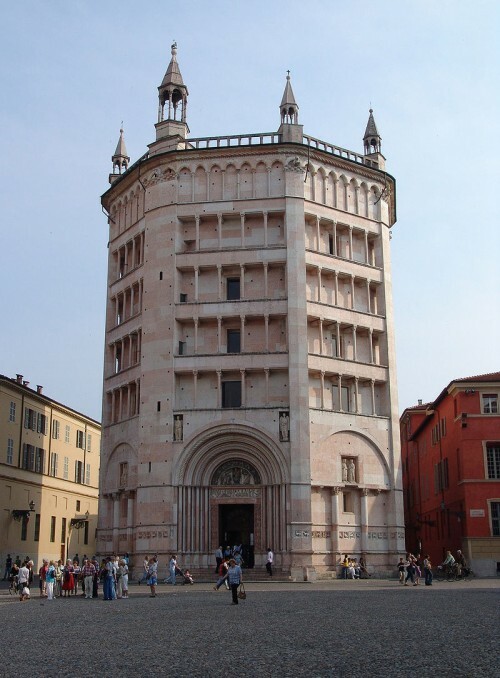 Parma, the beautiful city of Emilia Romagna, is a small wonder to discover and see in a day or on a weekend, to spend a different time together. A sign at the entrance to the city welcomes us in the “City of Music” a motto written at the entrance of Parma, but the city is more than that: just think that in it there are 330 cultural heritage sites! This beautiful, rich and small town of Emilia, is packed with pretty famous monuments, historic buildings and interesting food combinations to taste into fantastic and traditional dishes. Strolling along the street of Parma you can not help but pay homage to the opera: the Teatro Regio is the musical symbol of the city and the monument dedicated to Verdi in marble and granite will be a must to see (and take a selfie with). Passing through have a peek at the Teatro Regio “cartellone”, which boasts an interesting concert season and numerous opera festivals. Head, then, towards the Camera di San Paolo, by Correggio (Mon-Sun 8.30-14) and the Pinacoteca Stuard to continue your art visit. Continuing your visit you will be admiring the Ducal Palace, a building of the sixteenth century, surrounded by the Parco Ducale, a beautiful green space in which to have a break from your walk in total relaxation. To start the tour, let’s go from the district of Nuova Parma. In this neighborhood you can visit many examples of sacred architecture. Here you will find the Duomo, a beautiful Romanesque building, dedicated to Santa Maria Assunta. You must see the dome frescoed by Correggio – you will be impressed by the beauty of his works! In the church you will be stunned also by the interesting relief Antelami, The Deposition of Christ. Among the most striking example of Romanesque buildings, the church of Santa Maria Steccata has been probably designed by Bramante or even by Leonardo da Vinci. Worth to visit also the church of San Vitale – among the oldest in the city- which houses a chapel of the Virgin of Constantinople. Behind the cathedral is the Church of San Giovanni, the smallest and austere, but of great interest for its frescoes. Continue on to Piazza Duomo you will enter in the cathedral square: there it stands the pink marble Baptistery, adorned with numerous panels depicting animals. Also the Baptistery is another beautiful example of very special Romanesque architecture, as it was built in pink marble. Amazing also the Bishop’s Palace to visit. Among the town’s highlights, to discover also the old hospital, now State Archives and the Church of the Annunciation. Have a rest for a moment, head north to the Parco Ducale, where you can enjoy a good coffee in the shade. The park will take you with his great avenue to the Ponte dei Mille and then to Palazzo della Pilotta, the end point of your quick visit. In case you decide to take a few more days, you can get on with other parts of the city as the Citadel, the Paganini Auditorium and the many castles which spot the province. The complex of the Pilotta includes the Palace, temporary exhibitions, the Palatine Library, the Farnese Theatre and the National Gallery (Tue-Sat 8.30-19, Sun and holidays 8.30-14). In three hours you can visit the entire complex, in case the weather is not in your favour, do not miss the Teatro Farnese, especially wooden structure designed by Argenta. Leaving the Pilotta, take a moment to admire the great square in front of the Square of Peace, designed by architect Mario Botta. As the visit goes further, notice here how the large fountain was destroyed during the war and how its structure is remembered by the game of trees and water present. Then walk along Via della Repubblica until you cross the bridge over the river Parma and reach the oltre torrente. For lunch or dinner we are spoiled for choice: good restaurants, taverns and tasting opportunities, in each case for a sandwich not miss Pepen, a stone’s throw from Piazza Garibaldi. For a wine tasting get down to the nearby and very typical Osteria del Gesso. 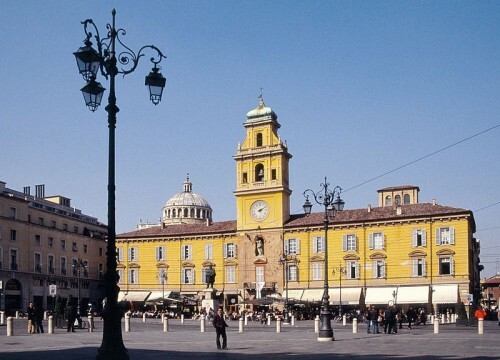 For coffee, instead, sit in Piazza Garibaldi and be captivated by the quiet atmosphere around you, planning, perhaps, the next visit to Parma, also called “the Little Paris”! Arrive by train is an excellent solution, whereas the train station is a few minutes walk from the historic centre. For those who prefer getting to Parma by car, there are various paid parking lot around the centre, including one along the river (Parking Goito). The walk within the city can be done on foot, both for short distances, so you can make the most of your day and discover the other villages and views around Parma. Just fifteen kilometres from Parma there is the ducal palace built by the Farnese family in the eighteenth century on the ruins of the ancient fortress. In the eighteenth century it was one of the most luxurious residences of court across Europe. It will amaze you with its gardens, partly Italian and partly in French, over four kilometres long, decorated with fountains and crossed by wide avenues. Equally charming and the four halls of the palace. A must- see will be the apartments of the Duke and Duchess and the astronomical observatory, too. Between Parma and the small town of Felino you will find the village of Sala Baganza. In its historical centre you can visit the fortress belonged to the Sanvitale family. Recent restoration work has affected the interior rooms of the castle, and it has been returned to its former glory. Just before Langhirano, on your right if you come from Parma, you’ll notice a massive defensive construction on a small hill, with square towers and three circles of walls. welcome to Torrechiara Castle: inside, the extraordinary Golden Chamber. This entry was posted on Saturday, October 3rd, 2015 at 12:02 pm	and is filed under Discover Italy. You can follow any responses to this entry through the RSS 2.0 feed. You can leave a response, or trackback from your own site.